Hi, I've made some planters to sit on top a block wall to obscure the junk my new neighbors keep in their front yard. The planters are made of composite decking and are 5.5" wide X 4.5" tall X several feet long. The plants will get plenty of sun and I can put them on a drip line too. What would be good that would grow thick, high, and last many years? I could make them 9" tall but I'm hoping 4.5" will suffice. That's not very much soil volume for a perennial plant of that size, but there is one that might work for you - Sedum 'Autumn Joy' is on the taller side of your range, and wouldn't require much soil, so this is certainly an option. The stems die off in the winter, but you could leave them until the new growth starts in the spring, along with their dried flower heads. These would be best throughout the summer, but they would at least screen the eyesore. More about them here; Sedum 'Autumn Joy'. These are clump-forming, growing about seven to 12 inches across in ideal conditions. Plant them about a foot apart so they'll fill in quickly. 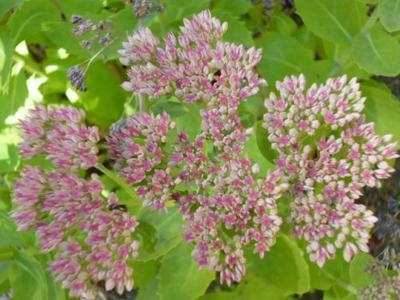 The flowers are pink, in a cluster that attracts butterflies and other pollinators. They wouldn't need much water other than what nature provides, and they love full sun.